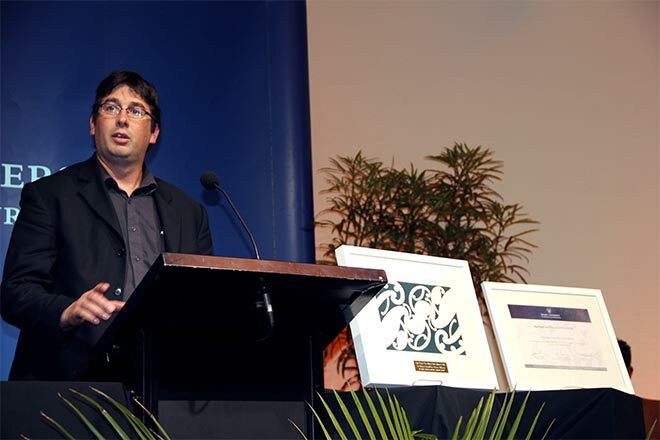 Basil Keane, director of Māori digital projects for Manatū Taonga the Ministry for Culture and Heritage, is seen speaking at the Ngā Kupu Ora Māori Book Awards ceremony in 2011. Te Ara received an award for its publication Te taiao: Māori and the natural world. Keane also gave the whaikōrero (speech) on behalf of the manuhiri (visitors) at the pōwhiri (welcome) for the ceremony.